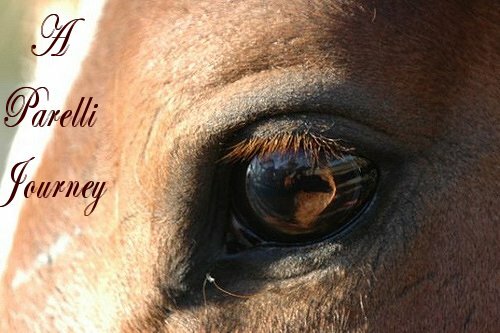 Bundy & Sante's Parelli Journey: We can canter!! We had a lovely day today!! When i walked into the paddock, he was chewing on the rug of the same horse that I left him with last Sunday. I sat down and waited for him to finish his game, and after about 10 minutes he wandered over. A few treats later & we left the paddock together. We worked on our bow. He's getting very very good at shifting his weight now. He just needs to learn to keep position, but we'll get there. Back up by the tail is doing really well. He's very good at it. And it cerainly makes grooming & saddling at liberty a lot easier. when he walks off, i take his tail, and ask him to back right up again!! Anyhoo, after a little bit of sideways work, we started the travelling circling game. My idea was to wander a little bit, and then get him to jump a jump (something that he has discovered that he can actually accomplish). Anyway - sent him on the circle, and after gently asking for a trot, he pinned his ears at me. So I asked for a change of direction. He was spectacular, the change of direction cue was a P1- he spun around and went straight past my shoulder, as he continued on the circle, i realized that i didn't recognise the rhythm of his stride, I turned around the see what he was doing, and he was cantering. My pony was cantering on the circle!! - We're talking about a horse who has had major issues with cantering & circles - All due to bad saddle fitting causing a wasted topline, and wasted hind quarters). He did a full circle before i disengaged him & bought him in. It was awesome! He did so well!! I let him stay with me for about 3-4 minutes and then asked for the circle again. Same result, after a few changes in direction, he offered the canter. We went away and did other stuff, like sideways over a trot poll & knocking over drums & things like that, and then I decided to ask for the canter & see what would happen. It didn't go to well, he freaked agian & ran off, after he ran off, he kind of stopped, turned around, looked at me, and gave me his "what happened?" look. I could only laugh and yo-yo him in. Little darling.. at least he tried. I'm also in the process of teaching him to pick things up. After his antics of last week, Every time he goes to pick up a stick, I say to him "pick it up", so that he associates the command with the act. We did end up going on a ride, and it was very exciting - we encountered motorbikes & speeding cars, and a big storm that never was, but we made it home in one peice. the big change i love, is that he now LOVES his face scratches. Sante was so so head shy when i got him, but using my "never release on a brace" technique, he now trusts that I will never do his face any harm, and loves nothing more than resting his chin on my shoulder & getting a face rub. Its the best part of our day!. When i put Sante in the paddock today, he found a nice patch of grass to lie down in and have a big roll - managing to roll all the way over!